The Feasibility Study will set the stage for the future design and reconstruction of the New Ave into a multiway boulevard as developed in the New Hampshire Avenue Corridor Concept Plan and Takoma/Langley Crossroads Sector Plan. The project kicked-off November 30, 2012. The outcomes of the study were presented to the Takoma Park City Council on September 3, 2013. The regional Transportation Planning Board co-hosted a workshop with the City of Takoma Park to delve into the outcomes of the Feasibility Study on October 25, 2013. Download the presentations here. A multiway boulevard separates fast-moving commuter traffic from slower local traffic. The slower traffic and street parking is positioned in the side lane along the sidewalk, shielding pedestrians from the noise and dangers of the faster traffic. Commuting traffic and public transit vehicles are accommodated in two travel lanes with turning lanes at intersections. Pedestrians are integral to the multiway boulevard concept, and gain access to half of the right-of-way. They can safely walk from the bus shelters in the side medians across the slow-moving traffic in the side lanes to 15-foot-wide sidewalks fronting businesses. Bicycles will share the side lanes with local traffic, where they are protected from fast-moving traffic of the travel lanes, but offered clear views across all intersections. Converting New Hampshire Avenue into a multiway boulevard is envisioned to make it a vibrant, sustainable asset that enhances the corridor’s pedestrian realm, transit access, environmental services, cycling opportunities and redevelopment potential. The feasibility study investigates the environmental, transportation and utility impacts of this conversion, and suggest options for their treatment in future planning and engineering, with associated cost estimates. A comprehensive assessment for roadway conversion to a multiway boulevard will be developed that will provide local and state decision-makers with technical and financial considerations necessary to carry the project forward. Takoma Park's New Hampshire Avenue Corridor Initiative boundary includes the 2-mile stretch from Eastern Avenue at the District of Columbia line to the Takoma/Langley Crossroads at University Boulevard. 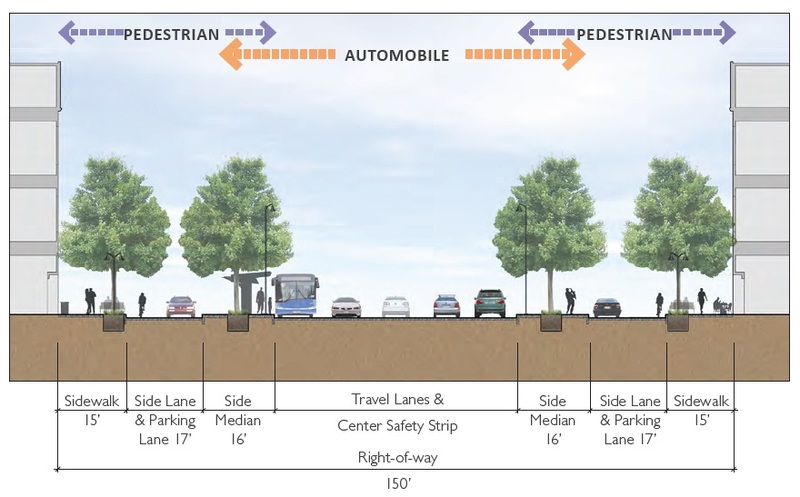 The right-of-way of New Hampshire Avenue (MD 650) will be widened from its various existing conditions to a consistent 150-foot width, in accordance with the 2000 Takoma Park Master Plan. The New Hampshire Avenue Corridor Concept Plan (orange area, right) recommends a multiway boulevard with 4 travel lanes along the southern 1.25 miles of the corridor. 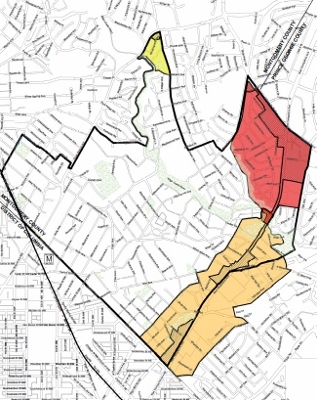 The Takoma/Langley Crossroads Sector Plan (red area, right) recommends a multiway boulevard with 6 travel lanes along the northern 0.75 miles of the corridor, accommodated by a Public Improvement Easement. The two plans slightly overlap at Sligo Creek Parkway. The traffic analysis and bicycle facilities options explored in the Feasibility Study address recommendations from the both plans. The City was awarded Transportation Land Use Technical Assistance from the Metropolitan Washington Council of Governments to fund the Feasibility Study. The award was announced July 18, 2012, and the consultant team consists of Nelson\Nygaard. and Sabra, Wang & Associates. Read more about the Planning Vision for the New Hampshire Avenue corridor and surrounding neighborhoods.